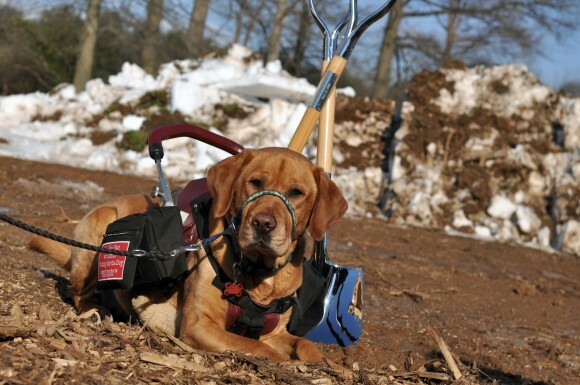 It has been an exciting week at Canine Partners for Life. On Thursday, March 16, we broke ground on the new Marian S. Ware Program Services Center! This building is phase one of The Partnership for Independence Campaign, an $8.5 million initiative to create facilities which are safe, accessible, appropriately sized, and respectful of the needs of the population of people we serve. 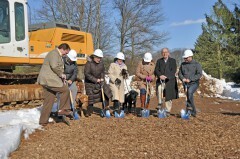 CPL staff, board members, volunteers, and supporters gathered on a small patch of dirt among the snow covered grounds to witness the groundbreaking. State Representative John Lawrence opened the ceremony by welcoming guests and sharing his appreciation for the services CPL provides both locally and nationally. Following his speech, John, and a few CPL staff and board members, shoveled the first bit of dirt to officially kick off construction on the building. The afternoon concluded with a champagne toast, led by Tory Kitchell, Campaign Chair, and a reception for guests. The Marian S. Ware Program Services Center, given with love from her daughter, Marilyn Ware of “The Woods” Charitable Foundation, will become the hub of CPL’s program activities; housing all staff (except kennel staff), a larger harness shop, interview rooms for both applicant and volunteer interviews, multiple accessible restrooms, entrances, and exits. The entire building will have improved efficiency and will be designed for our clients who utilize wheelchairs and scooters. The construction on this building should take about a year. To learn more about this campaign, please visit www​.k94life​.org/​c​a​m​p​a​ign.